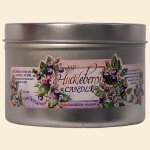 You will enjoy our elegant Wild Huckleberry Candles. Our special blend of quality wax is hand pured to perfection. The unique Wild Huckleberry aroma provides peace and tranquility with a delicious hint of romance. A treat no one can resist!